Sometimes your mobile phone or an alarm clock on your table are not the only things that can help you wake up in the morning or any specified time, especially when you are at work on the web. So when you are working on your mac, and its kept on, the music player iTunes also can help you wake up when you fall asleep. You just need to download the iTunes alarm application. 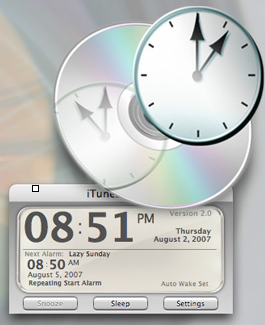 This iTunes utility turns your Mac into the most fully featured alarm clock you’ve ever owned. It’ll gently put you to sleep then quietly do the same for your computer. When its time to wake up, it’ll wake the computer first, and then rouse you from your slumber with whatever music or radio station you choose. You can change any playlist in the iTunes to play at a specified time. Wakes the computer from sleep automatically at specified time. Configurable snooze button which can ring your alarm if you want to delay it for some time. Random feature lets the computer choose a tune to wake you up. Download the iTunes alarm app from here. lol. That’s pretty neat. I use my cell phone alarm mostly now. But this is cool. They have done a good job to find more ways to keep people involved in their products. Great job. Thank you for this! I can actually wake up in the morning for class now! I used to use iPhone’s alarm and none of the tones can wake me up. This is really amazing!